Mary Dimitroff has had a love-hate relationship with gymnastics for 16 years. She began when she was just two years old, doing headstands against the coffee table in the living room while watching Blue’s Clues. She started in her first competition club team when she was 6. 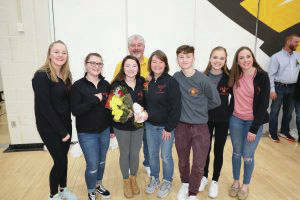 Mary has competed in States every year since starting competition gymnastics. She won level 8 states when she was 13, and became part of the Ohio team to compete for the state at regionals. During her high school years, she went to States since she was a freshman. 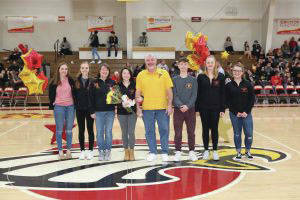 Her sophomore year she placed on beam at States and became part of the Big Walnut Wall of Fame. After high school, Mary plans on attending Mississippi State University for Aerospace Engineering. One of her favorite memories with the Big Walnut team was her freshman year, getting lost in Dublin Coffman with her entire team and being late to the meet. She also will miss all of the practice shenanigans— such as, flipping into XL pants, or doing dive rolls over standing teammates, or flipping on exercise balls, or making team pyramids that always come crashing to the ground.